Symbolism: The blue represents the waters of the Arctic Ocean that surround the three territories served by the unit. The inukshuk is a traditional signpost found across the northern landscape. In this badge, it also represents the direction and guidance given to cadets. 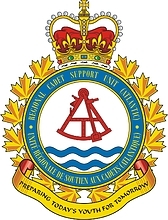 The colours echo those of the Canadian Forces Northern Area badge in order to reflect both the area command and the region. Motto: Meaning "Developing future leaders". Symbolism: The dark blue symbolizes the mountains of Alberta and the hills of the Canadian shield in northwestern Ontario. The lighter blue represents the sky. The wheat field refers to Saskatchewan and its agricultural heritage, and the buffalo symbolizes Manitoba and, by extension, the special human and natural history of the prairies. Motto: Meaning "A support for future leaders".